২০০৮ সালের নির্বাচনে বিজয়ী হয়ে ক্ষমতা গ্রহণ করেই হাসিনা সরকার সর্বপ্রথম যে বিষয়টিকে প্রাধান্য দিলেন সেটা হল বিডিয়ার হত্যাযজ্ঞ। পরিকল্পিত ভাবে বিডিআর হত্যাযজ্ঞ ঘটিয়ে ৫৭ জন সেনা অফিসারকে নির্মম ভাবে হত্যা করা হয় ভাড়াটে ভারতীয় কমান্ডো আনিয়ে। চাকুরিচ্যুত করা হল দুই শতেরও বেশি প্রতিবাদী সেনা অফিসারকে। এরপর বয়োজ্যেষ্ঠতার তোয়াক্কা না করে পছন্দসই জুনিয়র দু’জন উকিলকে সুপ্রিম কোর্টে নিয়োগ দিয়ে চীফ জাস্টিস সমেত ৫ সদস্যের একটি বেঞ্চ গঠন করা। সেই বেঞ্চের ৫ জনের মধ্যে ২ জনই ছিলেন হিন্দু সম্প্রদায়ের। তাদের একজন ছিল সুরেন্দ্র কুমার সিনহা। বেঞ্চ আসামীদের করা রিভিউ পিটিশন খারিজ করে দিয়ে একই দিনে তড়িঘড়ি করে আইন বহির্ভূত ভাবে বিচার কার্যক্রম সম্পূর্ণ হওয়ার অপেক্ষা না করেই ২৮ শে জানুয়ারি ২০১০ সাল, প্রত্যুষে একে একে ৪ জন সূর্যসন্তানকে ঢাকা সেন্ট্রাল জেলে ফাঁসি কাষ্ঠে ঝুলিয়েদিয়ে হত্যা করা হয়। হাসিনার উপস্থিতিতেই তারই আদেশে কাশিমপুর থেকে আনা জল্লাদের দ্বারা নৃশংসভাবে জবাই করে মেজর বজলুল হুদাকে শহীদ করা হল কারাগারের একটি কামরায়। এই পাশবিক হত্যাকাণ্ডকে বিশ্বপরিসরে শীর্ষস্থানীয় প্রচার মাধ্যমগুলো আখ্যায়িত করেছিলো, ‘Political trail, miscarriage of justice and Judicial Murder of Hasina’. এটাকে সমঝোতার রাজনীতির একটি জ্বলন্ত দেশ বিরোধী নিদর্শন বললে কি ভুল বলা হবে? এই গুরুত্বপূর্ণ বিষয়টি সম্পর্কে বর্তমান এবং ভবিষ্যৎ প্রজন্মকে ভেবে দেখতে হবে। এই সমস্ত দল আর এদের নেতা-নেত্রীরা নিশ্চয়ই দেশের জনগণকে গরু-ছাগল ভাবেন। তারা মনে করেন, দেশের জনগণকে বেকুব বানিয়ে ফায়দা হাসিল করা অতি সহজ। কিন্তু তারা ভুলে যান সাধারণ মানুষদের কিছু সংখ্যক লোককে কিছুদিনের জন্য বোকা বানানো সম্ভব হলেও সর্বকাল সবাইকে বোকা বানানো সম্ভব নয়। দুর্নীতিবাজ নেতা-নেত্রীদের বিরুদ্ধে বিচারের কথা উঠলে, বিদেশে টাকা পাচারের বিচারের কথা উঠলে এরা সবাই থাকেন নিশ্চুপ। যুদ্ধাপরাধীদের বিচারের বিষয়ে তারা সভা, মিটিং মিছিল, প্রেস কনফারেন্স করে মাঠ গরম করে ফেলেন। কিন্তু দেশ এবং জাতীয় স্বার্থবিরোধী কর্মকাণ্ডের বিরুদ্ধে থাকবেন নিশ্চুপ কিংবা দেবেন একে অপরকে প্রত্যক্ষ কিংবা পরোক্ষ সমর্থন যদি সেটা তাদের গোষ্ঠীস্বার্থ এবং তাদের বিদেশী প্রভুদের জন্য প্রয়োজন হয়! Barrister Moudud Ahmed, the former Law Minister and member of the standing committee of BNP expressed his satisfaction on the verdict of Banga Bandhu Sheikh Mujibar Rahman’s murder case. After the verdict was officially declared giving his reaction he said, “ This verdict provided solace to the nation. With this, rule of Law has been ensured. We all must accept this verdic of the apex court. He further said that this verdict must not be seen from any party’s angle but in the perspective of rule of Law. This verdict not only upheld the rule of Law but also had provided solace to the nation. We don’t want to see this kind of murder. Those killers who were involved in the killing of President Ziaur Rahman have also been tried. Though, not through the normal process of Law but they had been tried. Ex-Law Minister said all the five accused had appealed. Those accussed who have not appealed, this verdict to be hanged would also now be applicable to them. Quoting the Constitution this Lawyer said, according to the act 105 if there is any relevant new evidence or fact happens to be there then Review Petition can be lodged within 30 days. According to the Jail Code 991, once the order of the Supreme Court reaches the Jail authorities then after 21 days and within 28 days the order has to be complied with. That is why it is preferable for the accussed to file the review petition within 21 days. Usually, in case of review petition the verdict remains up held. And if the verdict remains up held then the accussed as per the clause 43 can submit mercy petition to the President. That petition would then be forwarded to the Law Ministry and Prime minister’s office. If the mercy petition is rejected by the President then the Jail authorities shall execute the verdict”. This leader of BNP and Lawyer however, carefully avoided mentioning that all his explained Codes, Acts and Articles were not applied in case of hanging 5 Golden Sons of the soil. The subjugated courts under the government refused even to accept their review petitions. He also did not say a word that the entire civilized world and human right organizations did not accept the staged managed trial in Kangaroo courts and termed the verdict as “Hasina’s political trial and miscarriage of justice”. “Bangladesh Jamaat e Islami believes in rule of Law. We are respectful to murder case the verdict given by the Apex Court after long hearing of the case”. Mr. Mujahid expressed this reaction yesterday, while journalists from various print and electronic Media wanted to know the reaction of Jamaat about the trial and verdict of the murder case of the founder of independence Sheikh Mujibur Raman. Even after knowing everything about the brutal killing spree at the BDR HQ at Pilkhana, BNP and Jamaat with out voicing any loud protest against this conspiratorial genocide misteriously remaind muted! This kind of silence would ever remain questionable in the mind of the people about their ideals and principles. Sheikh Hasina openly supporting Gen. Ershad’s taking over had said, ‘I am not unhappy’. 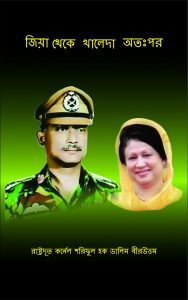 When Gen. Nasim staged a coup against President Abdur Rahman Bishwash at that time also Sheikh Hasina openly encouraged him with supporting statement. When a caotic instability was created country wide with scinister ‘Logi Boitha’ action program of Awami League and it’s allys giving the pretext for ambicious Gen. Moin & Co to force on the emergency rule to oust President Iyajuddin Ahmed on gun point and had installed Mr. Fakruddin Ahmed’s government at the behest of Indo-American Axis. At that time also, Sheikh Hasina publicly said that this change was the fruit of their monement. After this change a stage managed election was organized under emrgency rule in 2008. Through an unpresidented rigged election Awami League was made to win a land slide victory. In return, after becoming the Prime Minister Sheikh Hasina’s government gave an blanketed indemnity legalizing all the activites of Fakruddin’s government. The people at large did understand why was the emergency, why the government was changed and in whose interest the election was held. But the people were amazed to see that Khaleda Zia and the leaders of her Jote failed to catch the bluff! Rather, it appeared that knowing fully well that the aim of such an election was to bring Awami League to power, they decided to participate in that stage managed rigged election. Thus, it was possible to bring Awami League at the helm with over two third majority to serve India’s interest. Two third majority was necessary to bring desired changes in the Constitution. As a result the people now paying agonizingly with their lives and blood! The back bone of the nation, the armed forces has been crippled and turned into a guttless entity. The independence and sovereignity to a great extend has been sold out to India. It would not be irrational to say that a country and nation with bright perospect is being led gradually to abayss! In a planed way Bangladesh is on its way to be a dependant client state or an annexed state as per the conspiracy that was hatched up by the Chanakyas of India in 1971. Forein cohorts are playing their role duely. If the so called champions of the ‘Nationalism and religious values’ opposition Jote would have boycotted that stage managed election in protest then it wouldn’t have been possible to manage that kind of majority for Awami League. India and its foreign allys definitely would have tried to bring Awami League in power holding the one sided election ignoring that boycott. But that government wouldn’t been able to get the legitimacy, the people would also have not accepted the result of that kind of election. Did the opposition jote lacked in knowledge to understand this simple fact? It is hard to beleive!No rocket science is required to understand such a simple matter. In that case should it be taken that for some understanding or pay off Khaleda Zia’s jote had participited in that election to facilitate Awami League to win the election and provide legitimacy to Sheikh Hasina’s government? This needs to be pondered about as well. After Gen. Zia became President he appointed Gen. Ershad a characterless, corrupt, greedy officer as the Chief of Staff of the army considering that such a weak person would not pose any challenge to his power and shall remain as his obedient boot licker. But Zia did not know or he was made not to know that ambitious Gen. Ershad returned from India after selling himself to the RAW for his lust of power while he was doing his NDC course in India through his room mate, a shrewd diplomat named Muchkund Dube. When Gen. Zia considering himself to be the strongest person was flying high and ruling the country with absolute authority at that time the cunning dove Gen Ershad behind the scene was faning up to intensify grievances against Gen. Zia that was already prevailing within the armed forces for various reasons. RAW had also tied the knot between Gen. Ershad and Awami League as his political ally after he became the Army Chief. Even after Gen. Zia secretly compromised with India through Dr. Kamal Hussain and Barrister Amirul Islam, RAW had chalked out a plan to assassinate Gen. Zia with the approval of Indira Gandhi, the than Prime Minister of India. But after the debacle of Congress Party in the election for imposing emergency Mr. Morar Ji Deshai after becoming the Prime Minister ordered RAW to shelf the assassination plan. All these facts had been carried in the Media of India. That is why RAW picked up Gen. Ershad as the alternative. Gen. Zia was then so much intoxicated with power that nothing of these conspiratorial activities came to his sight.